Please note that as of Aug 2015, this app is no longer for sale! The PDF version is still available (see below). 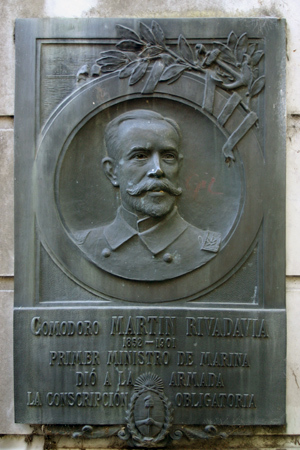 Regular readers might notice a new button in the sidebar… yet another way to experience Recoleta Cemetery is available! 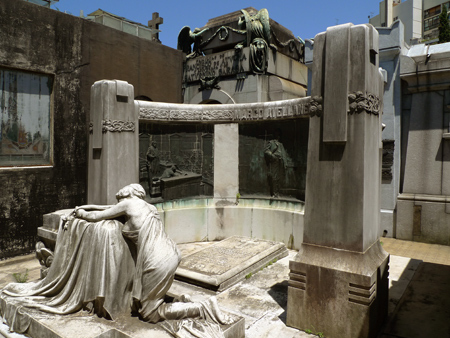 Our new venture, Endless Mile, is now live & we selected Recoleta Cemetery as the subject of our first travel app for the iPhone/iPod touch. A significant advance in mobile device technology has allowed this particular dream to come true. The PDF guidebook, first made available in Jan 2010, has been very well received but the app version makes a visit to the cemetery much more interactive. High quality, color photographs—a trademark of this blog—have been incorporated as well as an explanation of additional symbols & archival images. This app presents a new way to visit the cemetery & explains why it remains the number one tourist destination in Buenos Aires. Easy-to-use & fun to navigate, the cemetery’s top 25 tombs are highlighted in the walk. Both fans of urban legends & history buffs will find something of interest, & the app wouldn’t be complete without a description of the cemetery’s most famous resident, Eva Perón. Known simply as Evita to her devotées, her bizarre post-mortem journey is described in detail. 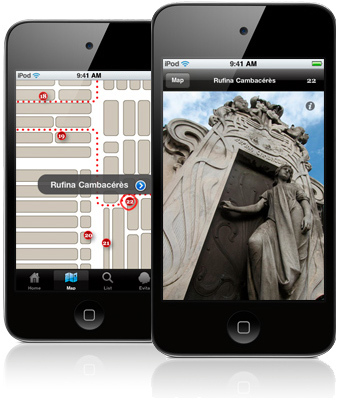 We’re excited to launch our company with the only app dedicated to Recoleta Cemetery. It engages those who are interested in learning more about the cemetery & makes sharing a visit with friends & family easy. The best thing about this app, however, is that it’s like consulting a tour guide whenever you want. Earlier this year I had the pleasure of meeting two guides who know volumes about Recoleta Cemetery: Mario Braun & María Fernanda Gomez. As much as I research & share my discoveries in this blog, there’s always more to learn… & they shared some fascinating stories. 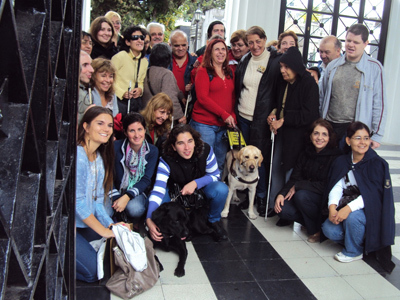 María Fernanda authored a book about handicapped tourism (“Grupos Turísticos y Discapacidad“), so when a group of the blind toured the cemetery she was contacted to tag along & document the event… complete with two guide dogs. Although I’ve never happened upon a group like this, I can’t help but think how wonderful it would be to guide them through the cemetery. 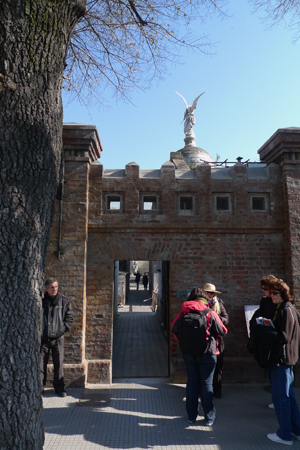 It is a place full of sensory experiences & several statues are at ground level. Imagine reading plaques by touch & visiting the following tombs without being able to see them… fascinating! First photo courtesy of María Fernanda Gomez. While cataloging photos from last year, I ran across an important event that went unposted. 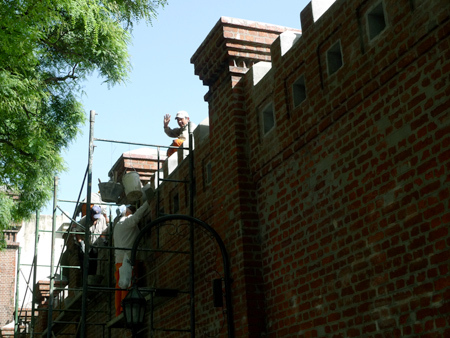 Repairs were underway to the exterior brick wall in February 2010 when heavy rainfall damaged the entrance gate. Somehow that story took precedence. 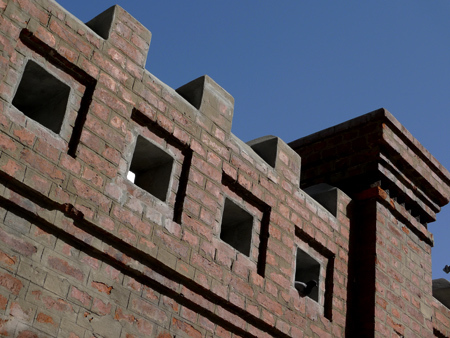 But the structure of the perimeter wall had become a haven for pigeons & badly needed repair. 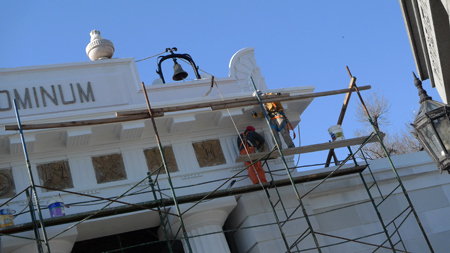 Workers went opening by opening, cleared each of debris & nests, & covered each in cement. The very top of the wall was also cemented. Note: Patchwork cement filling which has been drawn to mimic the original brick layout was done prior to the repairs mentioned above. In fact, since my first visit to the cemetery in 2000 the wall has looked like this… difficult to say when that work was done. But that’s not all they did. 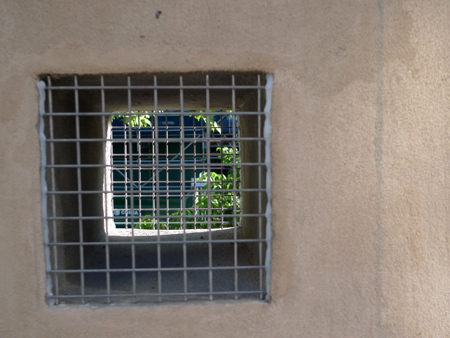 Instead of making nice new homes for pigeons like in the photo above, they covered each with mesh wire. Well done! Finally, much of the interior portion of the wall was covered as well. 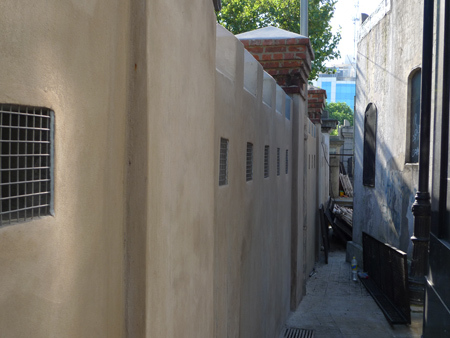 The work looks professional, makes a visit to this particular section more pleasant & will hopefully protect the wall from the increasingly extreme climate of Buenos Aires. Some pigeons have returned since this work was performed… perhaps rows of spikes will have to be added at a later date to discourage nesting. Typical for an election year, cultural offerings in Buenos Aires have increased over the past few weeks. Incumbent officials provide a few months of frenetic activity in an attempt to erase 3.5 years of neglect. Last night in conjunction with Earth Hour, the city sponsored “La Noche en Vela” (Candlelight Night) with different cultural activities across the city. 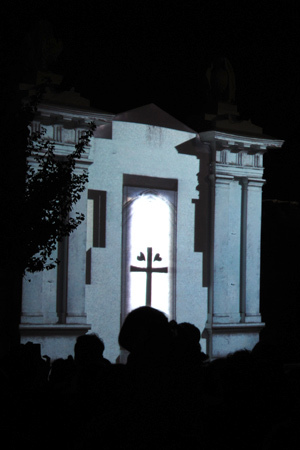 Recoleta Cemetery participated with an announced video projection on the entrance gate beginning at 21:00. Ironically, entrance gate lights had been shut off to support Earth Hour but a multimedia show which undoubtedly used more electricity replaced them. 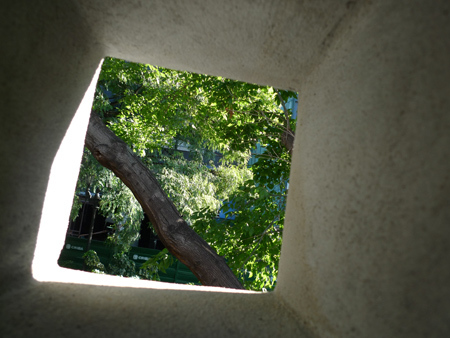 Even though the tombs of Pedro Ferré & Luz María García Velloso were incorporated into the show, there was little attempt at historical narrative. The timing of the show seemed a bit off as well… certain parts went very fast while others seemed to last an eternity. Many of the crowd of approximately 500 people drifted in & out, commenting that they did not understand the purpose of the show. I think an effort to incorporate information about the cemetery’s history would have been more appropriate than the overly dramatic theater skit. While mildly entertaining, Candlelight Night at Recoleta Cemetery could have been much better. 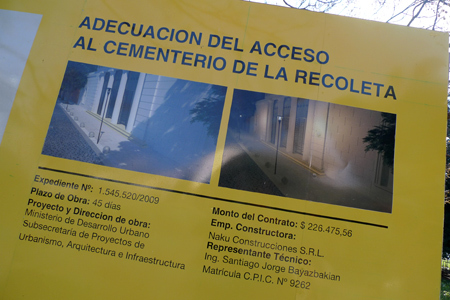 Following the rain damage in February 2010, access to Recoleta Cemetery through the main entrance gate was restricted. Urgent repairs were necessary, & at the closing of this blog in March some restoration had begun. Returning 3.5 months later, the city government seems to have taken advantage of events to undertake a larger project. 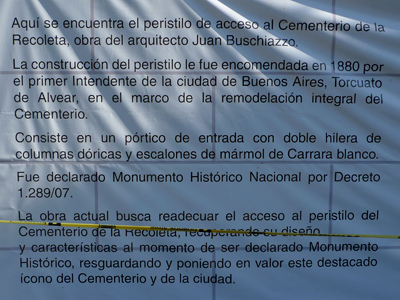 Aquí se encuentra el peristilo de acceso al Cementerio de la Recoleta, obra del arquitecto Juan Buschiazzo. 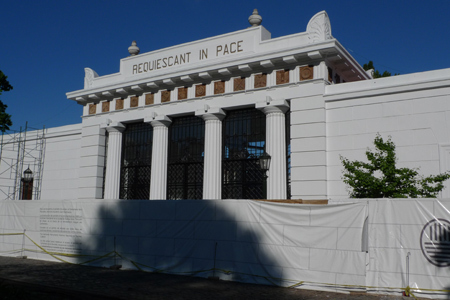 La construcción del peristilo le fue encomendada en 1880 por el primer Intendente de la ciudad de Buenos Aires, Torcuato de Alvear, en el marco de la remodelación integral del Cementerio. Consiste en un pórtico de entrada con doble hilera de columnas dóricas y escalones de mármol de Carrara blanco. Fue declarado Monumento Histórico Nacional por Decreto 1.289/07. 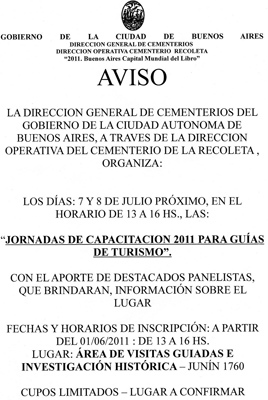 La obra actual busca readecuar el acceso al peristilo del Cementerio de la Recoleta, recuperando su diseño y características al momento de ser declarado Monumento Histórico, resguardando y poniendo en valor este destacado icono del Cementerio y de la ciudad. 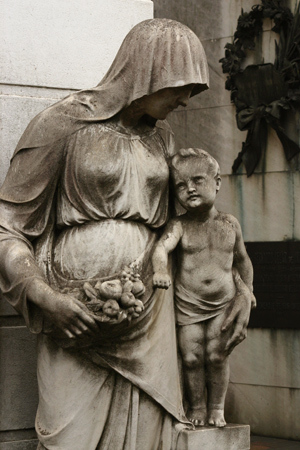 Here can be found the peristyle entrance of Recoleta Cemetery, the work of architect Juan Buschiazzo. 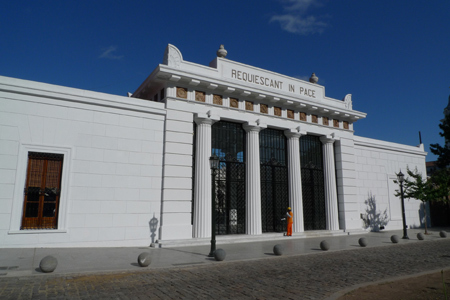 The peristyle’s construction was commissioned in 1880 by the first mayor of the city of Buenos Aires, Torcuato de Alvear, as part of a remodel of the entire cemetery. 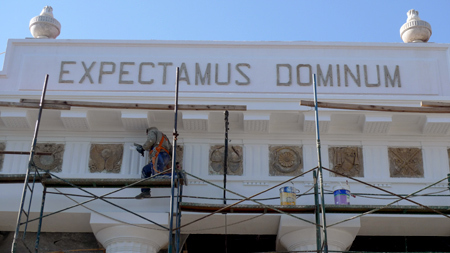 It consists of an entrance gate with double rows of Doric columns & white Carrara marble staircases. It was declared a National Historic Monument by Decree 1,289/07. 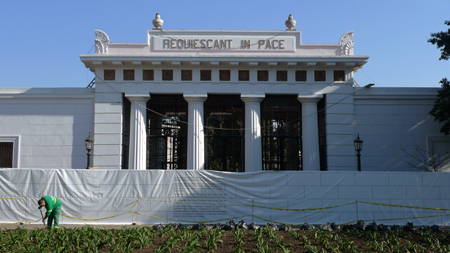 Current works seek to refurbish the peristyle entrance, recovering its design & characteristics at the moment it was declared a historical monument, saving & recognizing this well-known icon of the cemetery & of the city. It is interesting how the text alludes to the staircase destruction for those in the know & how it provides a cryptic message for those who don’t. There is no mention of rain damage. If the staircase is to be replaced, where will the marble come from? Seems like such a large project would take more than 45 days. 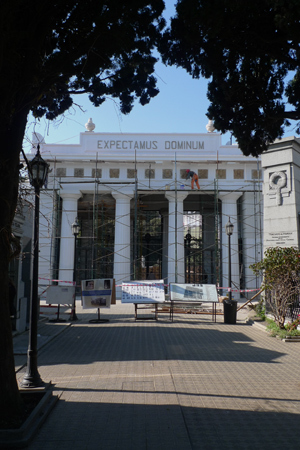 For a first-hand look at what archaeologists uncovered during the entire process, Daniel Schávelzon & his team wrote this article: “El pórtico central del cementerio de la Recoleta: estudio de su escalinata frontal”. Enjoy!